Road to Polish Con - Week 1 (Ever After Polish, Pepper Pot Polish, Inspurrrations) - Polish Etc. Guess what time it is?!? It's time for another round of Road to Polish Con! The Polish Convention is back in New York City this summer and next week starts the first round of special exclusive limited edition polishes that you can snag. 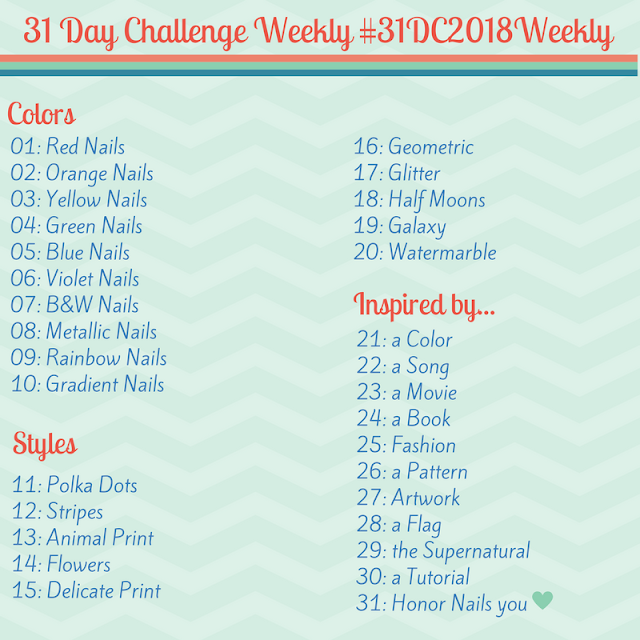 Each week will be a different group of indie nail polish makers to chose from. For Week 1, we have three makers; Ever After Polish, Pepper Pot Polish and Inspurrrations. Let's take a look at their polishes! Little But Fierce by Ever After Polish - A cool deep grey crelly with a rainbow of tiny shifting metallic flakies, subtle holographic shimmer and a shy pink flash. Oh yea. Gimme all the grey polishes! They have done a great job with this formula. It goes on smooth and was opaque in just two coats for me. The flakies are soft and subtle. This is two coats with glossy top coat here. Pixies & Spriggans & Sprites, Oh My! by Pepper Pot Polish - An icy medium blue metallic with blue and silver microflakies and a sprinkling of green toned multichrome metallic flakes. This shade is quite mystical. It is very shiny and shimmery. The formula is good but a little sheer. But you are distracted from the sheerness with shininess. I am showing you two coats with top coat here. If you look closely, you can see my nail tips but in real life you cannot. If you have longer nails, you will probably like a third coat. Psalms 74:17 by Inspurrrations - A blue toned purple creme with pink and green hex glitters, teeny tiny teal glitters, silver shreds and rectangle pink gems. There are a lot of different bits in this shade! Because of all the glitters and thicker gem elements, it can make the polish apply thick. I would recommend two coats of good top coat to get a smoother finished look. I am showing you two coats of polish with one coat of glossy top coat here. 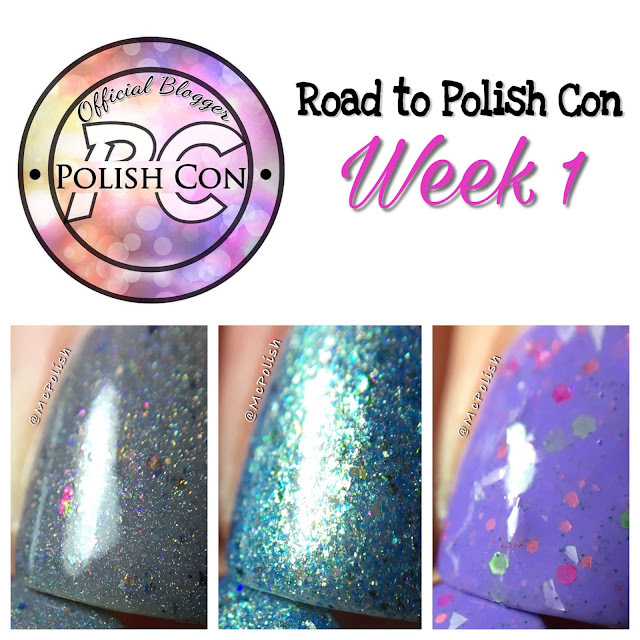 The Week 1 'Road to Polish Con' shades will be available to purchase 2/25 thru 3/3 from the Polish Convention site. Polishes are $11 each and there are two options from shipping. You can have your purchase shipped now or you can hold all of your polishes from each week to be shipped at a later date. Be sure to check out the latter option on the site because I know you are going to want more shades from this series in the upcoming weeks. Also...they ship internationally!! Another bonus this time around! When you are checking out with your purchases during this 'Road to Polish Con' series, be sure to use my code MCPOLISH to get some extra goodies added to your order for free! This may include nail glitter, stickers or other fun items (it's a surprise!). Who doesn't love extra fun bits added to their nail mail?! ?